Here’s the deal. I’m looking for an artist for a secret super duper special project (my next kid’s game, don’t tell anyone… shhh). Right now I need some art to give my work-in-progress play test document some flavor, I’m thinking one or two pieces of art should do it. So here’s what I need… send me a sample of dragons. I want to see your dragon drawings. Make them cute, tough, cartoony, serious. Send me a couple of dragons. If I like your dragon, I’ll pay you to draw something for me and maybe even hire you to work with me on my game. It’s easy money. 🙂 My address is newbiedm @ newbiedm.com, please put “Dragon” in the subject. 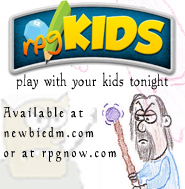 Have you checked out rpgKids, my role playing game for kids’ ages 4 and up?